We were lucky to find some fresh sole and as it is such a subtle flavoured fish, I decided to make quite a robust sauce to go with it. This prawn and caper butter fits the bill perfectly. Sole are not that easy to find in our local fishmongers. Here we get East Coast Soles and West Coast Soles but most recently the fish coming from the East Coast of South Africa has not been in abundance. I like to buy fish that is caught with sustainability in mind and from a company that uses ethical fishing practices. It is due to the shortage of this fish that the prices are high and I would not let a good piece of fish go to waste by treating it without some level of respect. This is why I chose to make my special butter to accompany the fish. 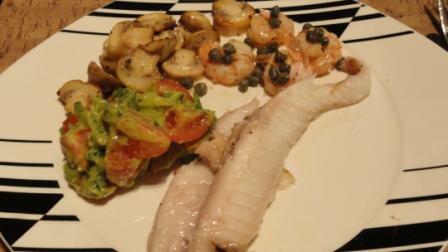 That sole looks divine.. it’s the only fish I really eat with relish! I love Sole but Dave could give it a miss! Hi Tandy, that review finally got posted and I linked to your blog! fantastic and thanks! I voted for urban sprout in the SA Blog Awards by the way. Gosh, Tandy, that’s a feast of flavours on one plate!